In the shamanic tradition, crystals are called living rocks. Indeed, their ability to transmute energy and transform consciousness has been known throughout time. For example, I have had inner experiences and dreams of Atlantis, and remember using huge crystals for learning, generating power, establishing harmony and balance, and curing illness. And this ancient knowledge is becoming more and more available today, through meditation and inner attunement, as a powerful means for healing ourselves and our planet. One's own inner knowing, and physical response, are especially important in choosing crystals. In a sense, we are selected by the crystal, rather than the other way round! Many people use appearance and aesthetics in the selection process, but I have often found that the most powerful crystals are not necessarily the most beautiful. I allow the energy of the crystal to speak to my intuitive mind, and trust the feelings in my body; I rarely have to think about whether a particular one is right for me or not. I allow the energy of the crystal to fill my consciousness, and focus on my internal response — yes, or no. In choosing crystals for others, I use a similar method. I hold the image of the intended recipient in my mind's eye, together with my purpose in wanting to give the crystal to that person. Again, it is far more a case of the right crystal coming to me than of me selecting it. I then hold the crystals under cool running water to cleanse them. I visualize clear light penetrating and surrounding them as I do this. I then place the crystals outside for a day or two in order to charge them. This clearing, cleansing, and charging process may have to be repeated at regular intervals, especially when crystals are used for intense healing and energy balancing. In such cases, the crystals can become contaminated. This can be recognized intuitively, or when the exterior feels sticky. I then bless the crystal to do its particular work, and give thanks to the Crystal Deva, the Great Spirit, and my guides for their help and protection in this process. It is then ready to act as a tool to generate power, catalyze healing and transformation, and radiate love, peace, and harmony. 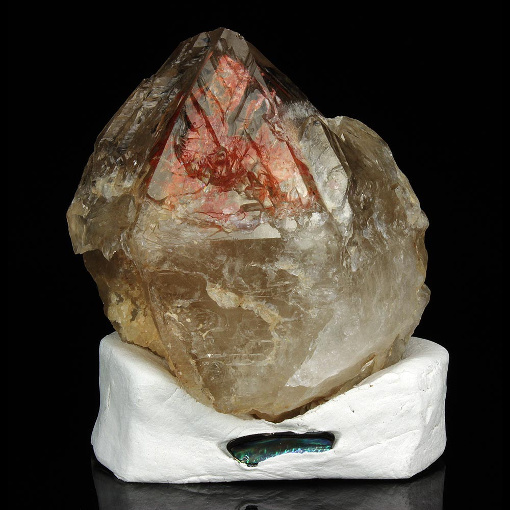 Note: Unfortunately, due to supply-and-demand and the unscrupulousness of certain dealers, a number of crystals on the market are not natural, in that they have been artificially heated or irradiated to change their color. This is especially true for citrine and smoky quartz, and for turquoise as well, which is often dyed. So be sure to buy from honest and reputable sources. And if you are in the Santa Fe area, stop on by, as I always have some special crystals available for viewing and/or purchase. Use the Contact link below to set up an appointment.